“Note: this page is about how to TEACH this concept to expectant parents. If you’re an expectant parent looking for info on labor hormones, their effect on labor pain, and what your partner can do to help you have a shorter and less painful labor, click here. 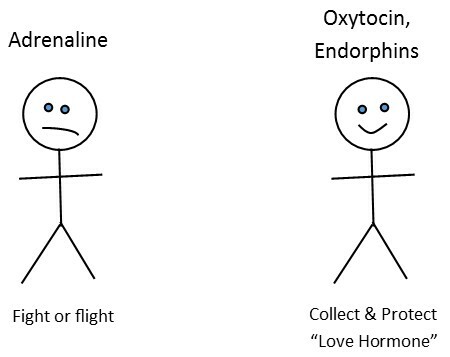 Oxytocin Causes labor contractions that dilate cervix Anxiety, bright lights, feeling observed, feeling judgedPitocin – if have synthetic oxytocin, make less hormonal oxytocin To increase oxytocin: Skin-to-skin contact. 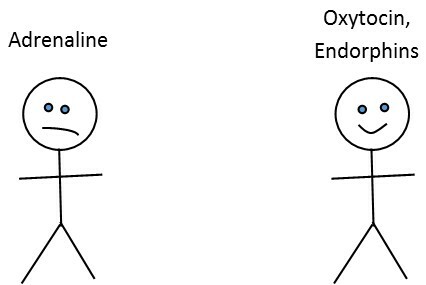 Catecholamines (adrenaline, etc.) In early / active labor: slow labor down(Imagine a rabbit in a field. If it doesn’t feel safe, it wants to keep baby inside to protect it)In pushing stage: Make you and baby alert and ready for birth, give you energy to push quickly. We know this or rather do we know this? Movement plays an important role during labor and birth. Through out the history of womankind, not just the last 75 years, women have changed positions as they felt the need during childbirth. Laying in bed to give birth was not a common practice. When you consider the physics of giving birth laying in bed for hours is counter productive to the design of a woman’s body. In a supine position or laying down a woman’s pelvic outlet closes and decreases the space for a baby to descend. Laying down in bed can also exacerbate and make any discomfort worse. Moving through childbirth is a great way to cope with the intensity of contractions and help labor to progress. This poster from Childbirth Graphics is a great teaching tool. It is also available as a tear sheet. It is important when woman are pregnant to have them along with their support person try as many different positions as possible in order to connect with their bodies and discover what makes them comfortable. 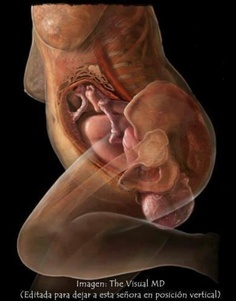 Having this knowledge and connection to their bodies will be of benefit during birth. It will give them the confidence to know what is right and intuitively they will work with their bodies to progress labor. 20+ Leading Birth Professional Experts Around the World Will Be Sharing Insights On How to Promote A Natural, More Comfortable, And Positive Experience! The interviews have begun! Check it out! “The pain of labor and delivery is probably the fact that scares most women during pregnancy! Many women have ruined the joy of their beautiful journey by dreading about the delivery pain. You may be facing the same concern now, especially if you are a first time mom and your due date is approaching.